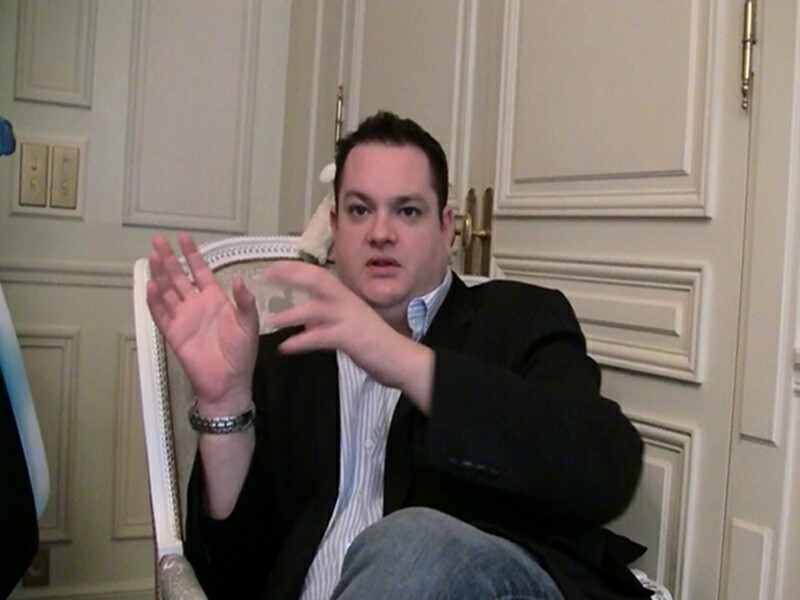 David Patch and John Vignocchi during a press conference in Paris, the day before the interview. "It’s all part of the artistic vision"
Can you present yourselves and tell us on which projects you have worked on before Tron Evolution ? J.V. : Sure ! 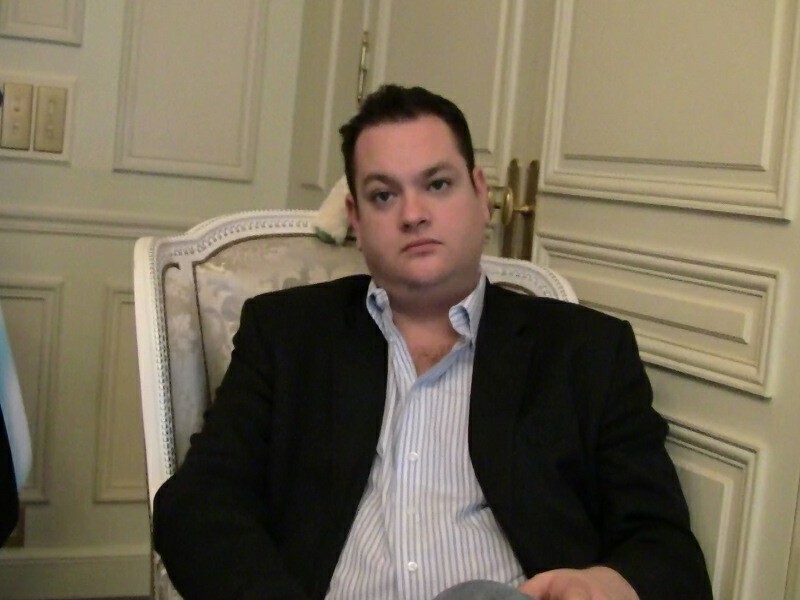 My Name is John Vignocchi. I'm a developpment director at Disney Interactive Studios. Prior to Disney, I worked at Midway Games on a lot of titles, a lot of sports titles. So I worked on NFL Blitz, MLB SlugFest, NBA Ballers series... Before that I worked at Vogster Enterntainment, brefely, where we did Robocalypse on Nintendo DS and iPhone, Unbound Saga and some other titles that were never actually released. At Disney Interactive Studios, I was working on Pirates of the Caribbean : Armada of the Damned and of course Tron Evolution. D.P. 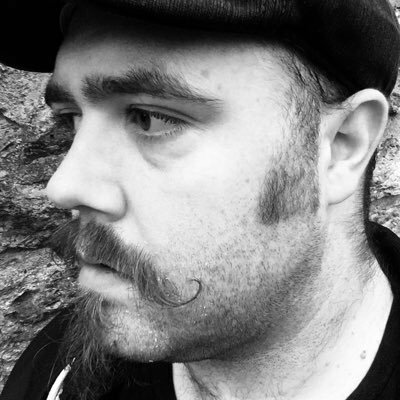 : I'm David Patch, senior art director at Propaganda Games. Prior to this I was working on a MMO for a couple of years, but before that I was with Maxis and EA. We're working on SimCity, SimCity 4, Unlimited, Sims 2, on a lot expansion packs. And even prior to that I was on Lego Island. There is a big gap between the artistic direction of SimCity and Tron Evolution so the next question will be for you. The world of Tron has a strong identity and on one hand we can think that this is easier to work on a masterpiece with such an identity, but on the other hand we can think that your choices are briddle. I don't know if you see what I mean... you are maybe less «free» than on other projects. Can you give us your point of view as a lead artist ? D.P. : So, Tron does with a very distinct and unique style. It has bounds, it has definition, definition of what is and what isn't ; because those boundaries become your base design. You have to innovate with that design. Ok ! we are making a city street and so you walk down the street and you take pictures and there is bricks, there is pavement... but here all had to be created from your mind, had to be through from artistic skill, developing a style that was established. So first it was very exciting. And two, You've got to be able take part of the ground. We've got to be able to expand these ideas. It wasn't just what was handed to us from Legacy. We was working on Tron City and there were Light Cycles for example. There're core design ideas, so we've got to take those design ideas and expend upon them to develop our story. So we've got to show different parts of Tron worlds. We'd got to create our own city, our own character, our own costumes to be integrated across the whole Tron world, into the graphic novel, into the wii, into the DS. This was a very interesting experience as well from the creator point of view because we've really had an impact on the world of Tron. After what ou said, have you got a preference to work on vehicules or characters or environments... ? D.P. : (laugh) It's like to say which part of the cake is the best ! You know, you can't make a cake without the eggs, without the flour or even without the plate. So it's all part of the artistic vision ; so you have to have strong world, you have to have amazing animations, you have to have brillant lighting and you have to have great character design to make the whole ambiance. Because if one of those thing is out of the line, the player, the user will see it and know it. So they are all my favorite. There is nothing special about any. They're all different parts of the recipee. "I think that people who were fans of the original film can jump into Evolution"
A question about The Script Now, maybe for John now. 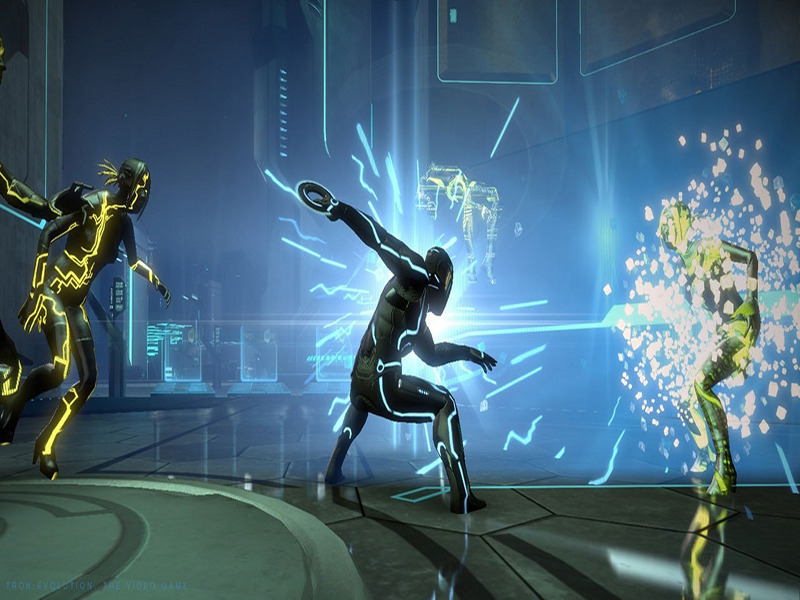 Yesterdey you seem to insist on the link between Tron Legacy and Tron Evolution. I notably think about the presence of some characters as Chorra. But can Tron Evolution be also seen as a following of the first movie and not only as a prequel to Tron Legacy ? Because even if you said that the story takes place between the two, you seem to consider it more as a prequel than a real "middle episode". Can somebody who has not seen the second movie and like the first one like Tron Evolution ? Absolutely. I think that people who were fans of the original film can jump into Evolution and immediately start identifying with characters like Kevin Flynn and Tron. Those characters are here to help imediately to bring fans of the original into the events of Evolution. It is a prequel story to what happen in Legacy but most importantly it is the bridge between 82 and 2010. So I think that not only having those recognizable characters. I think it's very important but I also think that having Tron City and having things like Light Cycles and Recognizers and things from the original film or iconic to the franchise which appear in Evolution help assuring all those fans of the original film into Evolution. That's a though question, that's a good one. The Wii version seems different from the HD game. Thanks. And don't you think there is a kind of paradox : on one way you say with pride that Tron Evolution has is own plot and that it not belongs to movie games, generally known as bad, but on the other way, the fact there are DS and Wii versions which seem both to be more "casuals" than the other ones correspond to the usual marketing plan of a licence game. The gamer may well not see the difference in it and see Tron Evolution not as a movie game but as a licence game which only try to take off benefit from all supports. J.V. : Yes. I think where you had wrong is that... You said that your are informed that the Wii and DS version are more casuals. They are actually designed for their specific systems. So what's important to know is that the things that make the Wii unique being its controls and the type of people who like to play on the Wii. We've designed the game specifically for that plateform to be that way. So I wouldn't say that it has less stuff or that it doesn't have the same production value. What I would say is that we've specifically designed it for those consoles and for the audience of those consoles. Yes but I spoke about the point of view of the audience. Because I played Tron Evolution and I find it rather good and may be people who have not try it will only think this is a licence game like others, because there is the Tron Evolution on Xbox 360 and PlayStation 3 which seems good and also the Wii and DS versions which are not game of action and which are, as often in this case, not designed for the same public. J.V. : Yes, I see. We tried to distinguish specifically the Wii and the DS by calling it Tron Evolution : Battle Grids. 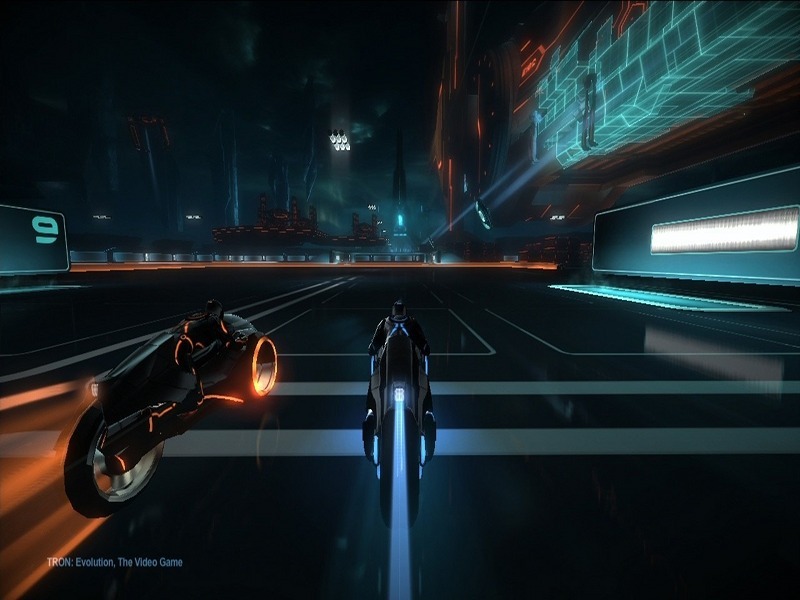 We wanted to keep Tron Evolution as the line of videogames which bridge the gap between 82 and 2010. So on the marketing and brand perspective that's why they have called it Tron Evolution but because DS and Wii versions take place during the Utopian might era and are focused on the game grids, we've called it Battle Grids. That was why we tried to make that distinction but they are not just a cheap version of next gen, in fact it's a totally different gameplay experience, it's a completely different story and this is a completely different controls and mecanics to play it, and so that's why we have done that. Everything from the title to the story, to the actual gameplay modes and mecanics and controls are different on Wii and intended to be designed specificaly for that audience. Did I answer your question ? 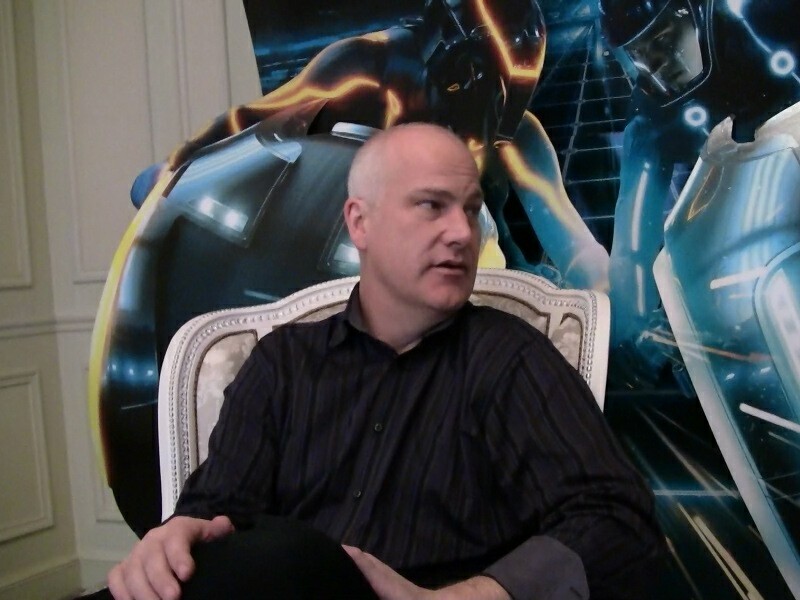 According to David Patch, the most important source of inspiration was the main support, the movie. "I’m flattered when people say that the game feels like P.O.P. because those games are amazing"
Yes. Maybe a question for David, for a change. Not about the artistic direction but a I think you can answer. I have played the game yesterday and today and as regard the gameplay, the most striking influence seems to be Pince of Persia. But can you give us other sources of inspiration which have help in the building of Tron Evolution ? J.V. : Garrett Hedlund ! D.P : No, not Garrett Hedlund. There was a great scene of watching this man jump off this platefom and throw light disc. And he just comes off spin and throw ! Comes off spin and throw ! "We have to get that : that's perfect for our game !" So what influenced us more than, I think, other videogame in our combat was watching this guy do the acrobatics and the combat in the movie. And so we had to base our combat on that and then we put parcours of free-running. That was much more major influence. But we are a lot of gamers, so we've played Prince of Persia, we've played Assassin's Creed, we've played Uncharted. All of those games, yeah, we've played them and we know that they are awsome, and maybe they have influenced us, subliminal or not. J.V. : And also I think it's important to note that even if there is certainly inspiration taking from those games but more importantly the idea was to make the game accessible. There are a lot of people who are fan of those games, I am one of them personally, and when I started seeing mecanics come to life in Tron I didn't necessary thought it was a bad thing. I thought we're with a gameplay mecanic that people understand and recognize. The challenge of the development team was to make something innovative and fresh with it and so I think it's good that it shares some mecanics because it make it become accessible to people who are fan of Asassin's Creed, Prince Of Persia and titles like that. It fits with... David just mention it, what they were doing in Legacy, parcour of free-running and the perspective in the film. I don't think that this is a bad thing. In fact I'm flattering when people say that the game feels like Prince Of Persia because those games are amazing. The accessibility of the gameplay is one of the most important points of Prince of Persia. This is why I said that. Yeah ! 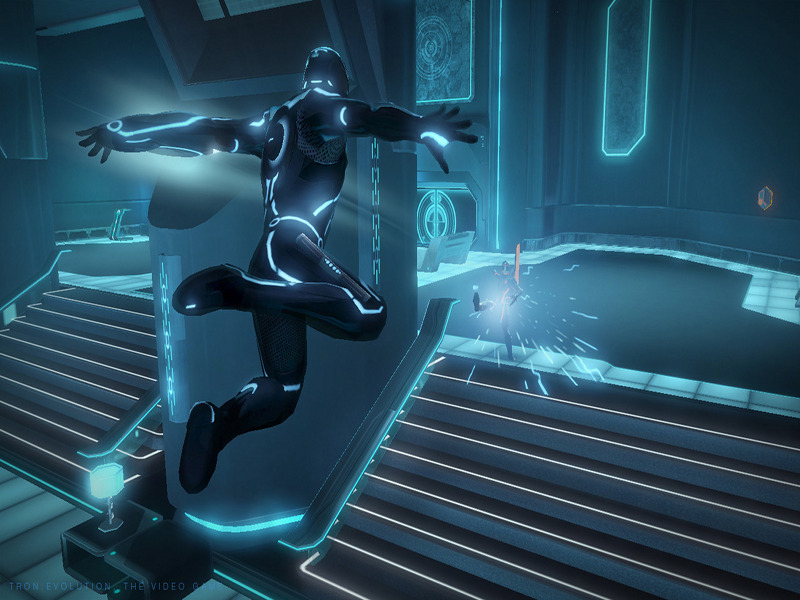 The other thing that is interesting about Tron ,and you get this that when you start playing it, it is that it doesn't... this this funny because it doesn't hold you hand (like elika in... - laugh) : when you jump off a plateform you die but one of the unique and original spin of the game was to give you the abiliity to traverse on any surface in the environment which is something that many game doesn't do and the game team allowed to travel on any surface. So there are certain environments, there are certain combat situations, there are certain puzzle where, just by using the ability of running across all the differrent parts of the environment, you can solve puzzle in different and incredible ways, you can skip fights with ennemies all together if you decide just to forgot them and go up and off along a path. 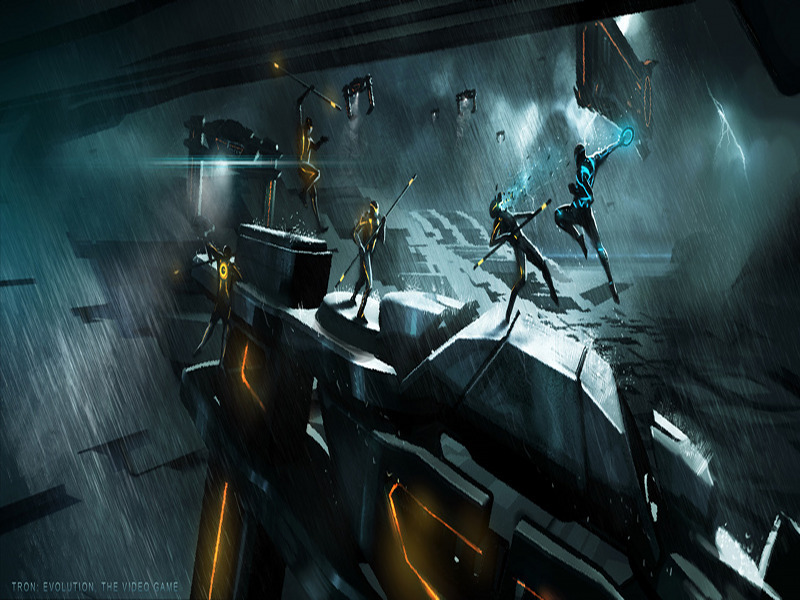 It isn'i linear and that respects the player choice and I think that is a twist parcour of free-running and mecanic that the game team put together that make tron feel different. The upgrade system of the game really seems to be interesting. 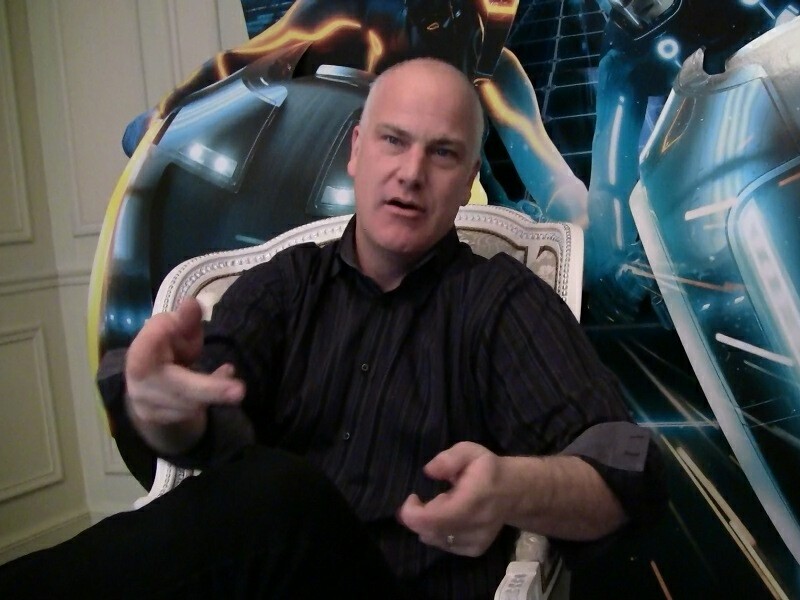 "One of my favorite aspect (...) was the ability that we had to expand Tron universe." And to conclude a question for each of you : what do you prefere in tron universe ? It can be a place, a moment, a character, a vehicule, etc. D.P. : One of my favorite aspect, actually, was the ability that we had to expand Tron universe. All thoses things that we had added. That's probably where my favorite aspects are. J.V. : I love you well ! 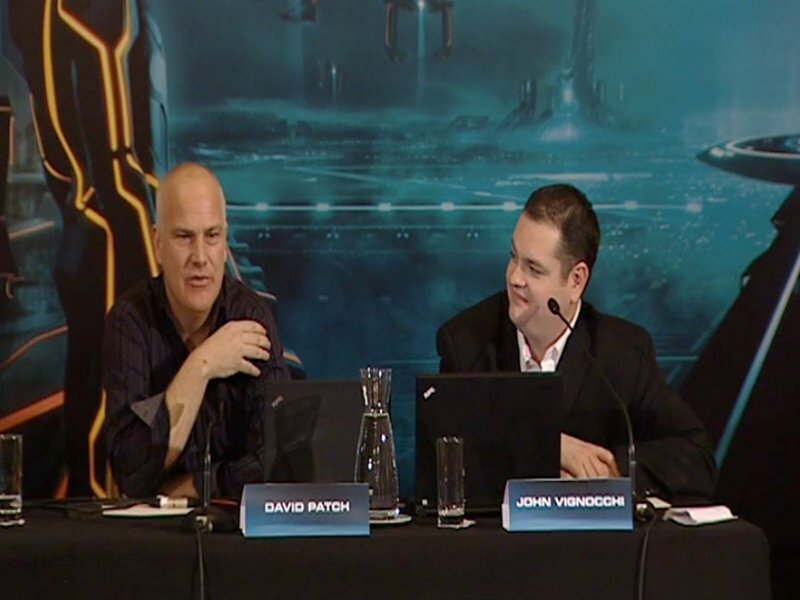 (regarding David Patch and showing me) He is my favorite aspect ! (to the press agent) Do we have time for one more question ?! OK, thanks ! You spoke about capacity in gameplay and i saw there is a kind of upgrade and experience system in the game, like in some RPG. Can you tell us more about this aspect which seems important but we have not seen at all ? J.V. : When player starts the game, he starts as a level one security program. As you defeat ennemies, they drop experience and that experience can then be converted into memory. Memory can be used as upgrade, to instal programs into your system, and that makes him stronger, better, faster. 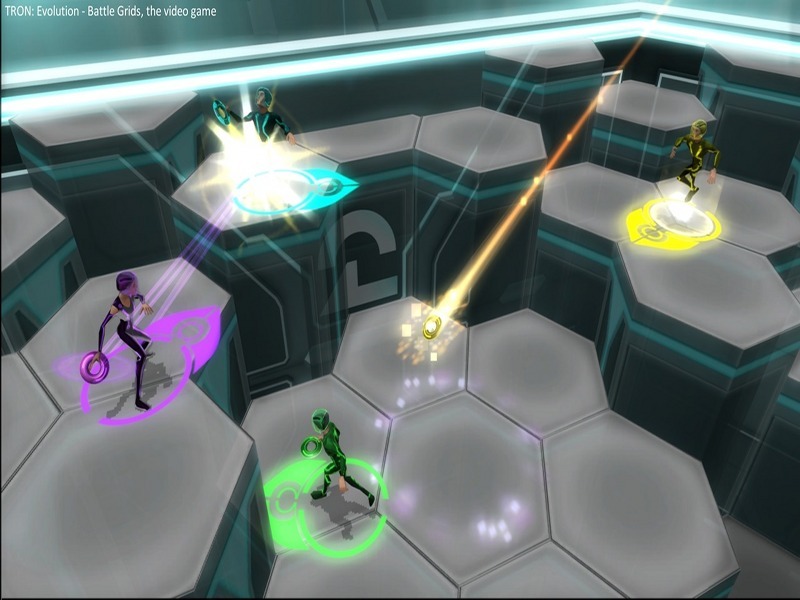 Those same upgrades can be carried over into the multiplayer game mode and vice versa. So in most traditionnal videogames you have a single player story experience here and you have a multiplayer experience over here. And everything you do in the story mode, you know, doesn't carry over to multiplayer. That's not the case in Tron. Because in Tron, if you go in the multiplayer and you've a level 15 or a level 20 character in the single mode, you can take it. But you can also from multiplayer, play, and take that character into the single player experience and play through. So, in addition to that, there is a lot of upgrades, there is a ton of upgrade there is over 60 different upgrades you can put in your character. You can make in more defensive, you can make him more defensive, you can upgrade your light cycle, you can upgrade the dommage over time with corruption disc... There are a lot of different ways for that people can twik and tunes their characters. You wanna to expand over there ? D.P. : Yeah ! And also you know, thoses light disc that you upgrade, there is three light cycles that you get through the story mode and each one of those has distinct abilities and one is faster, one's can take more damage, but on top of that, you can also use your disc upgrades to put shields on it or have speed boost you is actually my favorite one on the light cycle multiplayer because you travel side by side wit sombebody and then you do your speed boost and then you turn and cut him off ! On the other hand you've got the bomb disc with which you can throw grenades if you are with somebody on foot. It's a lot harder to do that with your light cycle. 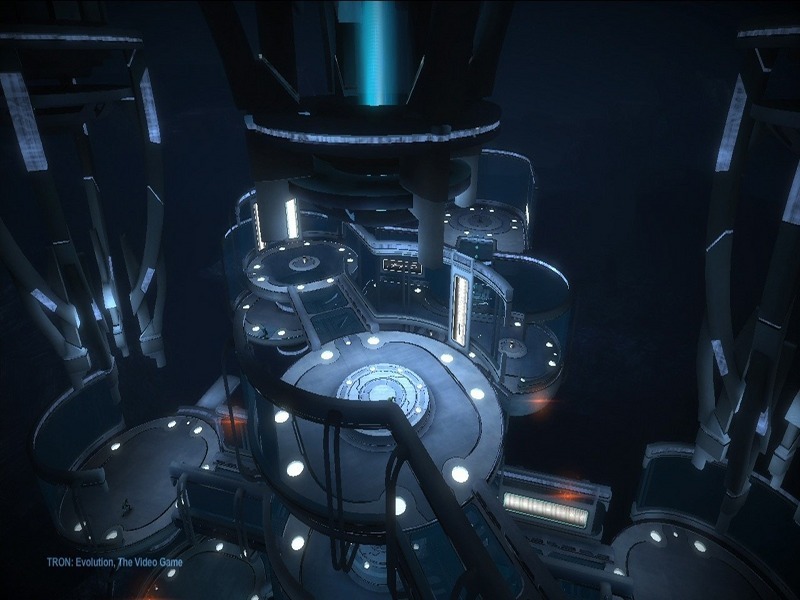 The progression of the player is at the center of what we have done, both in the multiplayer and the story mode. You have to progress your player, you've got to have those disc and to get more health and energy. J.V. : There is a level cap by the way, of 50 right now. We're thinking about to expand that with additionnal DLC. And I think that's all... 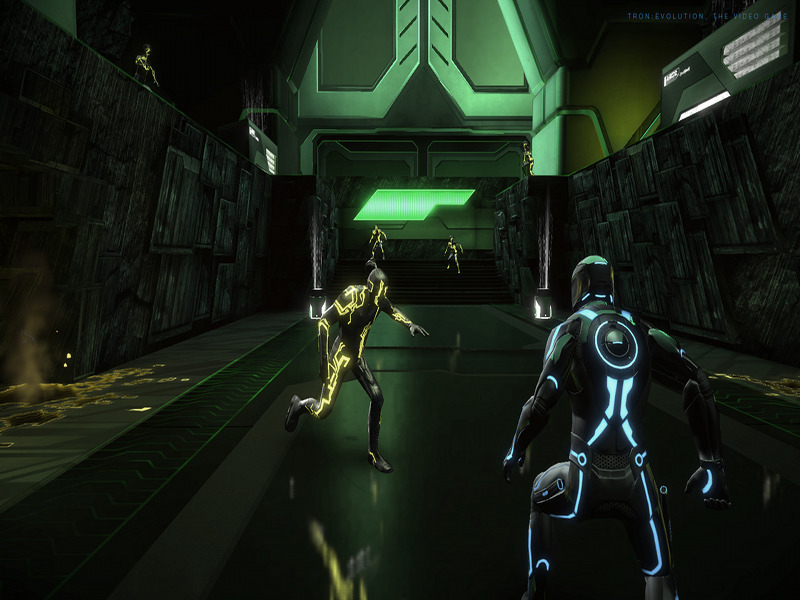 It's interesting you know, third person adventure games like this have already give you the ability to upgrade your player and that's make so much sense for the world of Tron because of, you know, the fact that there is a computer, the fact that you are gaining memory by defeating other program and you can use this memory to instal other programs. So it's fit with the overwall fiction and that's a thing i think the player will like. There a lot of little things like that.